The days of digging for change are over with the installation of pay-by-phone. How does it work? Believe it or not, it’s incredibly easy! Register at www.parkmobile.com, launch the mobile app on your Android, Windows, or iOS phone, or call the 1-800-280-4146 number posted on the meter. Registration will require a payment method be stored, such as: PayPal, Visa, MasterCard, Discover, American Express, or Parkmobile Wallet. We recommend registering through the website or the app for the quickest and easiest registration. Park in any of our marked Parkmobile enabled meters as indicated with a green Parkmobile sticker. Enter the zone number indicated on the meter, and space number (if applicable). Ensure that you have selected the correct vehicle and license plate. The Parkmobile service is voluntary. 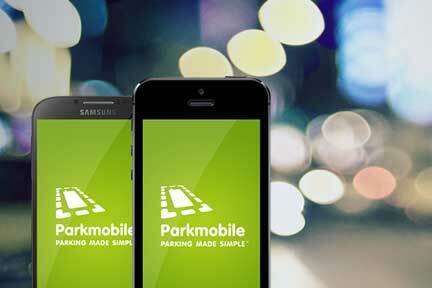 All meters that can be paid by Parkmobile can also be paid by coin. In fact, in most cases a damaged, jammed, frozen, or failed meters which may not be able to accept coins can still be paid by Parkmobile. Parkmobile payments do not integrate with the meters in Traverse City. Although the payment will not show on the meter, the enforcement officer uses the license plate number, zone number, and space number to view your Parkmobile payment on a handheld device. Because of this, please ensure that you add any additional license plate numbers accurately before creating a parking session in order to make sure your parking transactions are correctly created. IN LICENSE PLATE NUMERATION AND INSTEAD USES THE NUMBER “Ø”. The zone number is the four digit number in the middle of the green sticker posted on a Parkmobile enabled meter. Zone numbers vary by street and parking lot. In Traverse City, zone numbers range from 6801 to 6887. Zone numbers are a critical part of your transaction and must be recorded correctly in order for your parking session to be identified correctly by the parking enforcement staff. If you receive a meter violation when your Parkmobile session is active, contact Traverse City Parking by calling (231) 922-0241. Please have your Parkmobile receipt and ticket on hand to initiate an appeal.